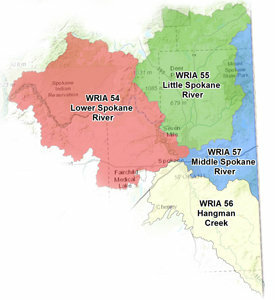 In 2014 the Watershed Planning & Implementation groups for the watersheds that comprise the Spokane River drainage in the state of Washington consolidated their administrative functions to gain time and cost efficiencies and further coordinate regional watershed planning and implementation. The regional group includes the WRIA 54, WRIA 55/57, and WRIA 56 groups. Each of the WRIA groups completed the watershed planning process under RCW 90.82 and developed watershed plans and detailed implementation plans. During the 2018 Legislative Session ESSB 6091, codified as RCW 90.94 Streamflow Restoration, was passed to address issues raised by the 2016 Washington Supreme Court Decision, Whatcom County v. Hirst, Futurewise, et al. The new law directs the WRIA 55 Initiating Governments, in collaboration with the planning unit, to update the WRIA 55 Watershed Plan to include projects and actions that will measure, protect, and enhance instream resources in WRIA 55. At a minimum the watershed plan update must include those actions that the planning units determine to be necessary to offset potential impacts to instream flows associated with permit-exempt domestic water use. The plan update is due by February 1, 2021.